Are you planning a weekend getaway for couples in Upstate NY? Of all the romantic things to do in Buffalo, NY, one of our favorites is having an intimate meal with your loved one! There are so many of fantastic restaurants in nearby Buffalo, it may be difficult to narrow down your choice. 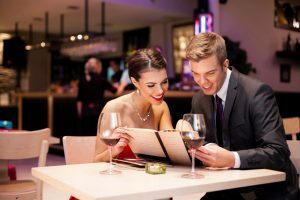 Here are three of the best romantic restaurants in Buffalo, NY! We’ve listed a couple of the most romantic restaurants in Buffalo, NY, but you may want to have date night a little closer to Asa Ransom House. If that’s the case, download our free Vacation Guide! We’ve listed our favorite Clarence, NY, restaurants, including our own on-site upscale, farm-to-table eatery. Planning your romantic escape is easy when you use our free Vacation Guide! Download it today! Wine aficionados will love visiting enjoying a meal at Bacchus Wine Bar & Restaurant! The restaurant offers small and large plates that are seasonally designed and perfect for sharing. Most of the menu items are classic American and French meals with a modern twist, like their Bouillabaisse. It’s paired with a tomato and fennel broth, chorizo sausage, mussels, scallops, shrimp, and gnocchi. You can indulge in the filet mignon, which is served with a wild mushroom and gnocchi salad and a pancetta demi-glace. Each of the dishes has been perfectly paired with an excellent wine. Enjoy classic Italian dishes expertly prepared at Tempo! This restaurant’s seasonal menu features adventurous proteins and fresh ingredients served in a warm setting that echoes an old-world charm. Combine that with their impressive wine list, which features rare vintages. Some of the most delectable items on the menu include the foie gras, which is served with a peach compote, pork belly, and a Riesling gastrique, and served on top on french toast. Another great dish is the wild boar ragu, which is made with a red wine braised shoulder of wild boar, with coriander and basil served on top of fresh pasta and topped with fresh Manchego cheese. For an innovative meal, visit Hutch Restaurant. Featuring both small and large plates, Hutch Restaurant features everything from calf liver to escargot. One of the most famous dishes is Hutch’s “Bacon on a Plate,” which features three (yes, three!) different types of bacon. Another famous meal is Hutch’s Steak Frites, which includes a 16-ounce prime ribeye and California fries, topped with a black truffle butter. When you’re planning a romantic getaway, your venue of choice is important. You want to stay in the most romantic bed and breakfast after eating at the most romantic restaurants in Buffalo, NY! Consider booking our romantic getaway package! Simply choose from our romantic rooms, and we will include a four-course dinner (five-courses on Saturdays), and a full country breakfast. Please call 1 (800) 841-2340 to book this reservation or check our availability and book online! We look forward to having you.